This is it, a surf style palm leaf bungalow on the beach. Simplicity at it's finest. Sleeping to the sound of the waves and waking up to the view of the turquoise water. One of the best places in the world for kitesurfing is the Dominican Republic, especially the flat water lagoon paradise in Buen Hombre. Buen Hombre is a hidden gem. A rustic, non-commercial, non-touristic fishing village surrounded by mountains and 15 km away from the windiest beach in the Dominican Republic. Buen Hombre has still preserved rustic real Dominican Culture unspoilt by tourism; surf-style, fresh seafood, rum and living right at the spot on the beach. In the perfect conditions, you can learn to kiteboard a lot faster saving you time and resources which is what this location provides. On average, Buen Hombre has 6-10 knots more wind than Cabarete. In the summer for 3 months the wind averages 25-35 knots. The water is flat and shallow and ideal to learn and practice your tricks. You can kite all year around and there is very consistent wind most days. There are many down winders available from 14-27 km in beautiful waters with some nice waves further out. Motoconchos, mototaxis and moto rentals make getting around easy! Also, it is a lot safer as Buen Hombre is a small village and there is no hectic traffic. Taxis and rides from the Kite Camp are also easily available. Santiago is the closest airport at just a 90-minute taxi ride away. There are also buses available which can help you get most of the way. Being a small fishing village, it's always easy to get your hands on some fresh seafood. There's also lots of freshly picked fruit and vegetables. Small village nightlife but in the Kite Buen Hombre Camp, there is a bar, restaurant with movie nights, salsa, merengue, bachata classes and music every day! In addition to kitesurfing, you can also enjoy wakeboarding with a features park with ramps and some sliders, fishing, spearfishing, SUP, jeep and moto rental, diving, hiking, dancing lessons and a lot of cultures. WIFI internet available in the Kite Buen Hombre Camp, and a few other places on the beach. Internet speed is good enough for movie streaming nights. Phone signal has been available in the village since last year! Buen Hombre Kite Camp/ Hotel offers wooden and palm leaf bungalows right on the beach which remain very cool, airy and are very cute. Options are two queen beds, queen bed and single bed and single bungalows. Prices from 25 USD a night. Breakfast and dinner 5- 7 USD with a very wide variety of fresh, healthy food cooked by the local chef. Even Lucky the puppy enjoys the flat water. Cell phones? Who needs them at the beach! Kite Buen Hombre welcomes beginners and pros alike! With excursions to Paradise Island, you'll never get bored of the scenery. Creator, producer of concepts, ideas, film and music. Been to Buen Hombre? What did you think? Where are the Best Kitesurfing Beaches in Buen Hombre? Kite Beach is the most popular spot and enjoys a good mix of flatter water and waves on the reef. When it gets windy it can get choppy on the inside and during peak times it can get busy. Hold off for an evening session or get out during lunchtime to avoid the masses. 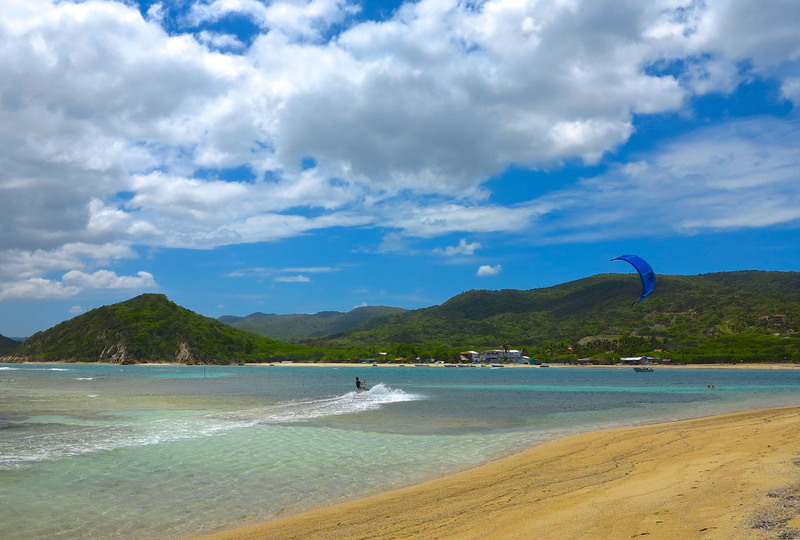 When is the Best Time to go Kitesurfing in Buen Hombre?